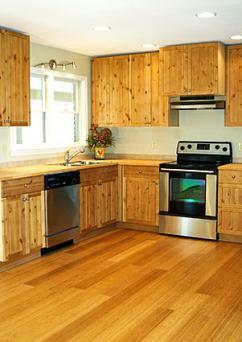 Bamboo kitchen cabinets offer an attractive option for those who want eco-friendly, durable wood cabinets. In today's environmentally aware culture, many people want to make choices that improve their lifestyle while minimizing any negative impact on our environment.One of the advantages to using bamboo in cabinetry is that unlike hardwoods, which take 10 to 15 years to grow, bamboo grows fast, up to a foot a day, and can be harvested within five to six years. For people who are trying to be environmentally responsible, bamboo is a good choice because it regenerates quickly after being harvested, and as a real plus, you don't have to sacrifice looks or affordability to be eco-friendly. Not only are bamboo kitchen cabinets a wise, eco-friendly choice, but they also are attractive. Because bamboo grows around the world, it is available in a variety of colors and wood grains to complement just about any decor. Very durable: its 50 percent harder than oak and referred to as green steel when used for building cabinets. Some timber bamboo has tensile strength that's stronger than iron or steel when calculated on a strength-per-weight basis. The reason for this strength is that each strand of bamboo grows perfectly straight, unlike trees, and it has less contraction and expansion than wood. Dimensional stability: Bamboo cabinets don't warp or shrink. Shelves don't sag, and doors stay aligned. Many of the popular vendors who market bamboo products are based in California, but with increasing popularity you can find them on the east coast and in the central United States, too. Cabinets can be customized by many of these manufacturers, however modular bamboo cabinet units are also available through a few companies for less money. 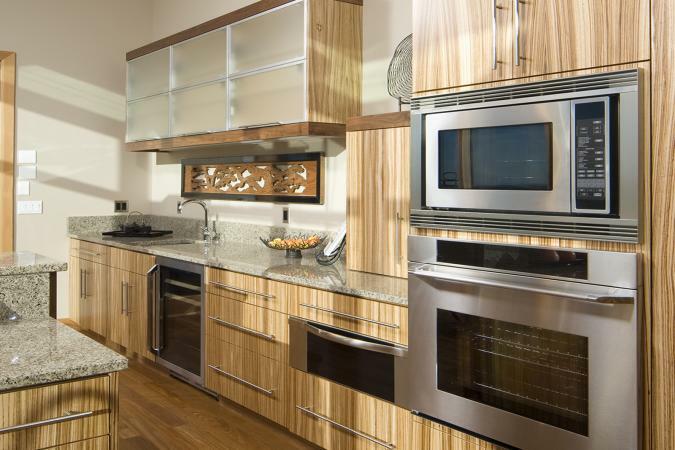 Neal Kelly Cabinets: Based in Oregon, Neil Kelly offers cabinets made from sustainable materials including bamboo. BambooCabinets.com: This company offers design services that tailor to the customized needs, wishes and budget for customers in the San Francisco area. KitchenCraft Cabinetry: This store offers bamboo kitchen cabinets in a beautiful, natural finish. Eco-Home Improvement: Rough price estimates are available through their showroom. Laguna Bamboo: Located in Laguna Beach, California. Bamboo is gaining in popularity for use in decorating kitchens and bathrooms. Different preferences drive trends, and in this case bamboo's increasing market desirability is due not only to its good looks and durability, but because it is a renewable resource. These same features also make it a viable alternative for flooring and the manufacture of furniture. If you're planning a kitchen remodel or building a new home, consider the impact on the environment and choose a renewable resource. Check out bamboo kitchen cabinets. You won't be disappointed.